When contact lenses work really well, you forget they are on your eyes. You might not feel the same at the end of a long day staring at a computer screen. After too many hours of wear, the lenses and your eyes dry out, causing irritation that might outweigh the convenience of contacts. Stanford University researchers hope to alleviate this pain by both advancing the understanding of how natural tears keep our eyes comfortable, and developing a machine for designing better contact lenses. The work was inspired in part by a graduate student’s dry eyes. Bhamla isn’t alone. More than 30 million Americans currently wear contacts, but roughly half of them switch back to glasses because of contact lens-induced symptoms such as dry eye. Bhamla and Fuller suspected that most of the discomfort arises from the break up of the tear film, a wet coating on the surface of the eye, during a process called dewetting. They found that the lipid layer, an oily coating on the surface of the tear film, protects the eye’s surface in two important ways – through strength and liquid retention. By mimicking the lipid layer in contact construction, millions of people could avoid ocular discomfort. In their most recent study, Bhamla and his co-authors outline two functions of the lipid layer. One is to provide mechanical strength to the tear film. Lipids in this layer have viscoelastic properties that allow them to stretch and support the watery layer beneath them. Bhamla likens this protective lipid layer to a swimming pool cover. You can’t run on the open water, but even a thin tarp can provide mechanical strength to support a person’s weight. The lipid layer also prevents the tear film from evaporating away. Eyes are roughly 95 degrees Fahrenheit (35 degrees Celsius), which is usually warmer than the ambient air. Like any liquid on a hot surface, the eye is constantly heating its liquid coating and losing moisture to the air. The key to producing comfortable contact lenses, then, involves designing lenses that don’t destabilize the tear film. 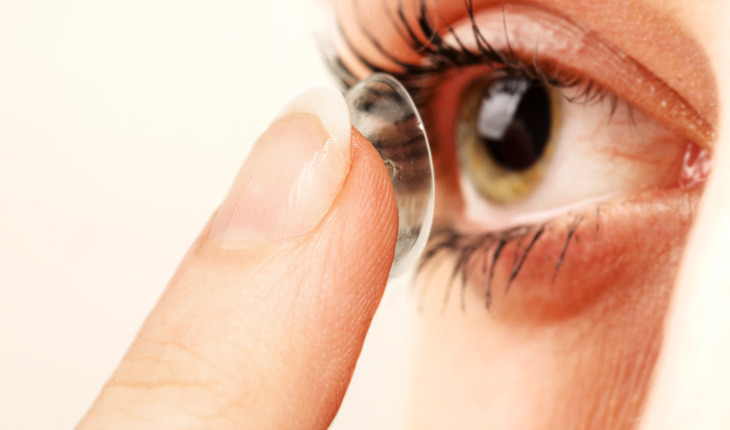 Manufacturers recognize the importance of protecting the eye’s natural tear film on a contact lens surface to minimize painful symptoms such as dry eye, but it is not an easy thing to measure. To solve this, Bhamla and Fuller built a device that mimics the surface of the eye. The machine, called the Interfacial Dewetting and Drainage Optical Platform or i-DDrOP, reproduces a tear film on the surface of a contact lens. It allows both scientists and manufacturers to systematically handle the unique array of variables that affect the tear film, including temperature, a variety of substances, humidity and the way gravity acts along a curved surface. With the ability to accurately recreate a tear film on the contact lens surface and test how quickly it breaks up, manufacturers are now armed with the tools to make a more comfortable lens that protects users from the painful side effects of wearing contacts. Even Bhamla may trade in his glasses for a new pair of lipid-protected eyewear.